We have gotten a bit slack lately so the taller half and I have made a pact to focus more on vegetarian dinner dishes. My first committed effort was this fabulous mushroom risotto. It takes a while and a constant attention but it’s rich and well worth the effort. Meat lovers would definitely not miss their meat in this dish. An assortment of mushrooms. I used portobello, oyster and enochi. Heat oil in pan and sautée mushrooms (excepting the enochi) for about 2 minutes on medium heat in olive oil then remove from pan. Put rice in pan and stir until rice is coated in oil and starts to take on a golden colour. Then add in white wine and stir until wine is absorbed by rice. Then stir in 1/2 cup of stock at a time keeping the stirring continuous and only adding more stock when previous stock has been absorbed. 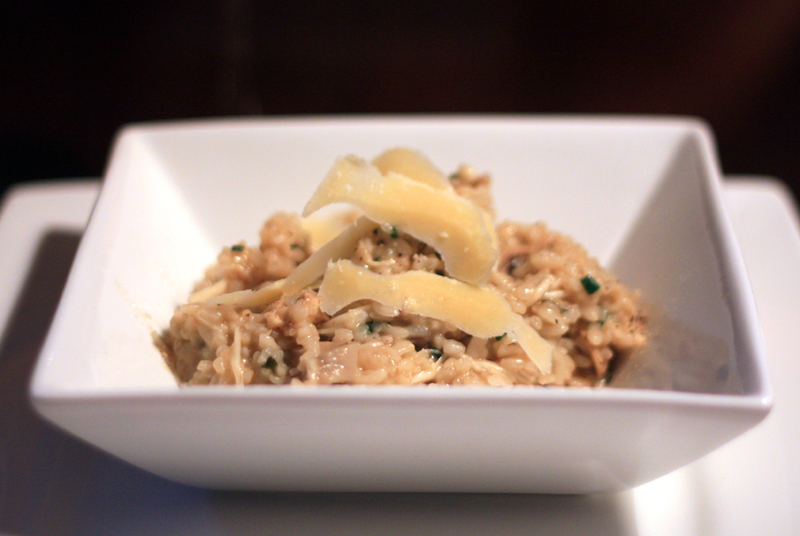 Once the rice is ready take off the heat and stir in parmesan, chives, enochi and butter. Serve topped with shaved parmesan and cracked black pepper.